Putney & Wimbledon Brass Band is a local, traditional brass band available to hire for events in South West London and beyond. Typical events that we play at include bonfire nights, fairs, marathons and sporting events, carol concerts and beer festivals. We’ve even appeared on live TV! We’re open to consider any type of event, private or public, big or small. Our repertoire ranges from traditional brass band music and marches, to contemporary tunes from film, TV and the charts. We’ll be happy to work with you to come up with a set list to suit your needs. 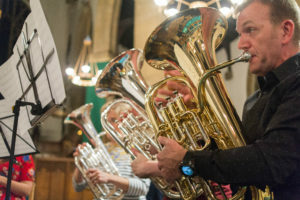 A brass band will light up the audience at any event, and Putney & Wimbledon Brass Band do so with professionalism, a sense of fun, and – of course – a fantastic sound. Not our words, but those taken from some of the lovely feedback we’ve received! So if you think your event could be enhanced by the traditional sound of a British brass band, fill in the form below, and our Events Manager will get back to you as soon as possible.